Locust Grove, Georgia is about a 40-minute drive south of Atlanta's city center. The Atlanta suburb is peaceful but a very active town. My expectations of a slow sleepy town diminished as soon as I exited the busy I-75 at exit # 212. Bill Gardner Parkway is a multi-lane highway lined with many gas stations, hotels, eating establishments as well as other retail businesses. 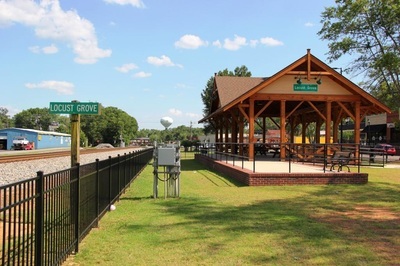 Driving east to the end of the parkway and a right onto State Road 42 (US-23), will bring you to the Locust Grove train watching platform. Locust Grove offers ample free parking next to the platform and behind the row of downtown stores across the street. My weekday afternoon visit to Locust Grove scored me one of only a handful of available parking spaces in the lot next to the train-watching site. The spots were occupied by not train-watchers but patrons of the busy row of stores & restaurants across the street. Later in the day spots were plentiful. 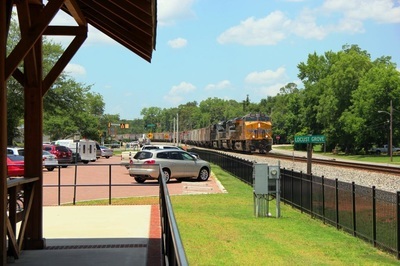 The train-watching platform is in a wonderful location on the west side of the railroad track, so photography of trains is best in the afternoon hours. During my 7 hour visit, two or three other fans passed by, one of which was very knowledgeable about the rail line. The rail line seemed busy. I saw 10 trains during my visit which was more than I expected. None of those were coal trains, which are supposed to past several times a day. Most of the trains I saw were double stack trains, auto-racks and merchandise trains, one short local also passed powered by a couple of SD40-2's. 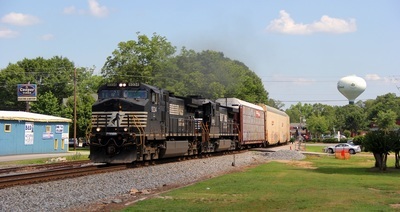 A Union Pacific locomotive leading a southbound train was the only foreign unit seen. 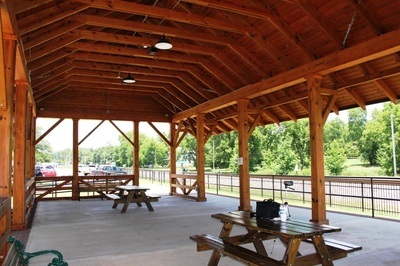 The covered pavilion has two picnic tables and several benches with a lot of open space for beach chairs. 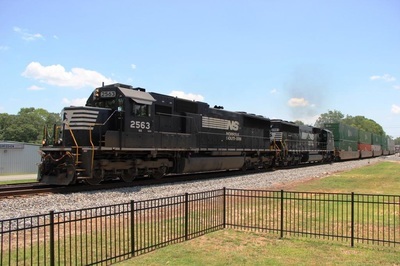 There is a scanner feed to listen into the Norfolk Southern train radio and lights for nighttime railfanning. 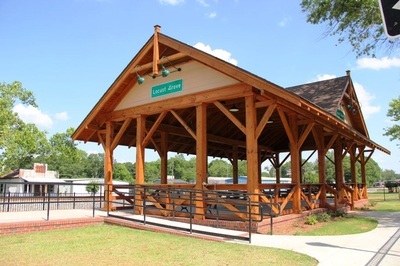 During my visit on a 90+ degree day, the pavilion provided shade and cooling with a slight breeze, there is also a water faucet on-site that a local jogger used to cool off, what a great idea! 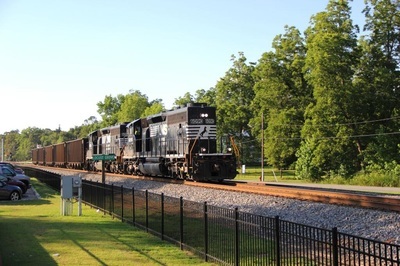 There are several grade crossings in Locust Grove, so I had heads up for both north & southbound trains. State Route 42 is a busy single lane road with lots of traffic and plenty of trucks; as a matter of fact it was hard to hear the radio scanner with the loud truck traffic at times. My original plan was to stay for 3-4 hours, the rail activity kept me there for 7. I plan to return to Locust Grove on my next trip to the Atlanta area. Railroad(s): Norfolk Southern Railway. Single track main past the platform, passing sidings are located both north & south of Locust Grove. Rail Traffic: Expect about 1 train an hour, although bunching may occur on both sides of Locust Grove and treat you to a group of trains during a short amount of time. My 7-hour visit lead me to see 10-trains. Site Details: A spacious covered pavilion with picnic tables and benches. 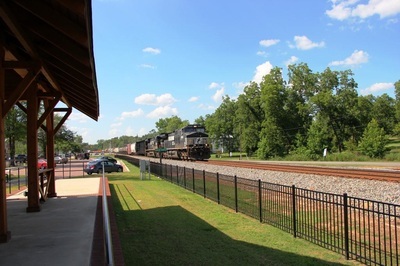 Extended platform offers plenty of room for photographers and fans looking to shoot video of passing trains. Radio scanner feed and lighting also contribute to the train watching experience. Restrooms on site: No. There are several restrooms nearby including some within walking distance. A Texaco gas staion mini-mart is a short walk down the road; other places are a short drive down to Bill Garder parkway. Food: None on site. Across the street is a busy pizza restaurant as well as several other privately owned restaurants, a market as well as a Texaco mini-mart. Picnic Area: Yes, 2 picnic tables and several benches located under the pavilion. Parking: Free Parking. A lot next to the pavilion is the ideal place for train-watchers. There is another parking lot behind the row of stores across the street. Street parking is also available. Lighted for evening rail fanning: YES. 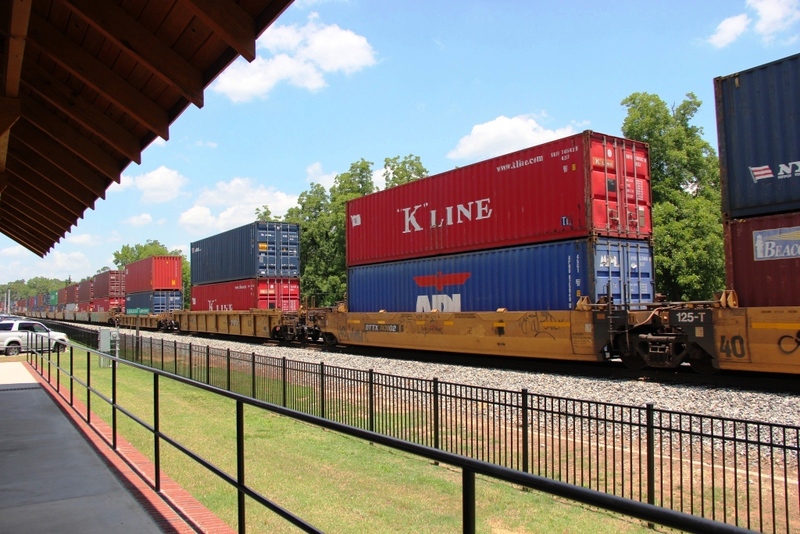 Motels / Hotels: There are no railfan motels located in Locust Grove. Locust Grove does have several hotels near I-75 on Bill Gardner Parkway. 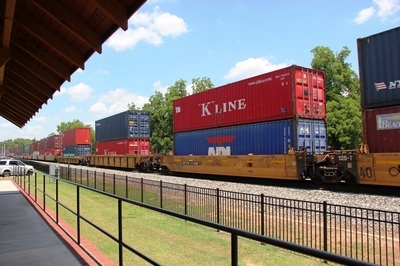 The closest "railfan motels" are in Morrow, GA which is 25-minutes north on I-75. Morrow not a busy rail line, I only witnessed 1 train during a one night stay. You may be better off staying in a Locust Grove hotel and watching trains at the pavilion during the evening.